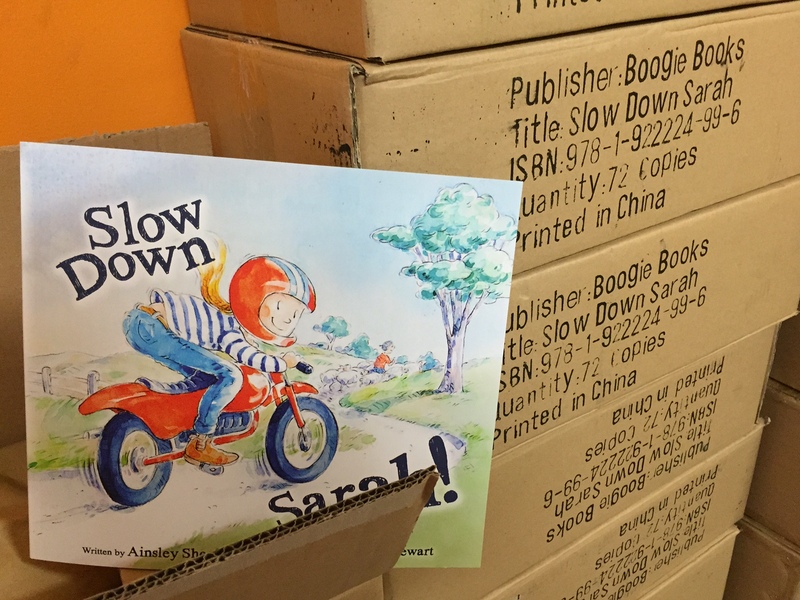 Uncategorized | Slow Down Sarah! 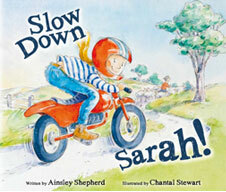 Ainsley Shepherd’s Slow Down Sarah! makes for a jolly read-aloud adventure. The rhyming text is jaunty and playful yet still carries a gentle message. The visual effect of the word art adds to the cheerful, active nature of the story. Chantal Stewart’s illustrations are vibrant and humorous. Each double page spread is bursting with colour and motion as Sarah zips across the countryside on her little red motorbike causing havoc where ever she goes. The expressions on the animal’s faces are a highlight. This gorgeous picture book with its many subtle layers will engage and delight readers of all ages. 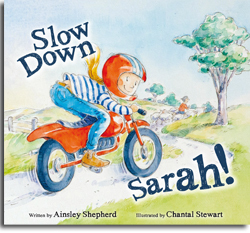 Slow Down Sarah is an exhilarating ride through country Australia with all the energy and verve you would expect from such a crackingly fabulous character! The energetic rhyming text is a pleasure to read aloud and I dare you not to ‘take off’ yourself as you delve into this delightful story. This entry was posted in Uncategorized on 17/06/2015 by One Heart. So now it was time for Sarah to make an entrance into the world! 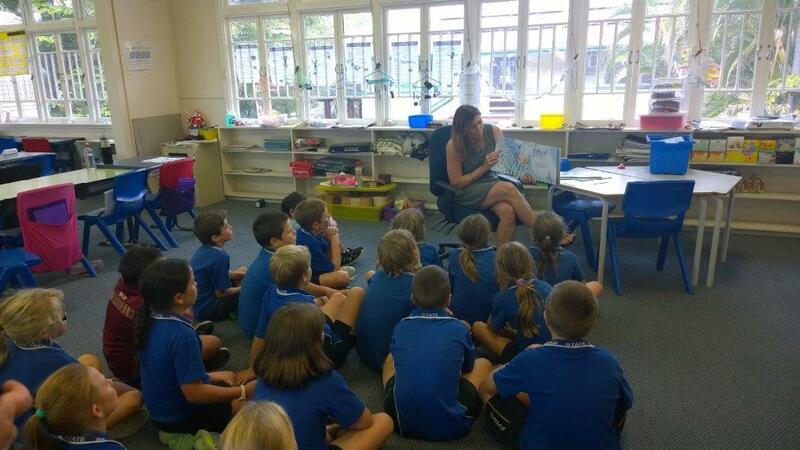 And what better place than my son’s classroom, at Gayndah State School! As a Mum, involving my children with the process of bringing Sarah to life has been the greatest of fun! And what fun this was! By the time we were finished, I was feeling as though I might change my career to that of a primary school teacher! As I shared with them the process of writing and seeing Slow Down Sarah! published, I was amazed at the questions they asked, their good humour and how wonderfully they responded. In fact, I even had a few offers from kids to become my book agent! 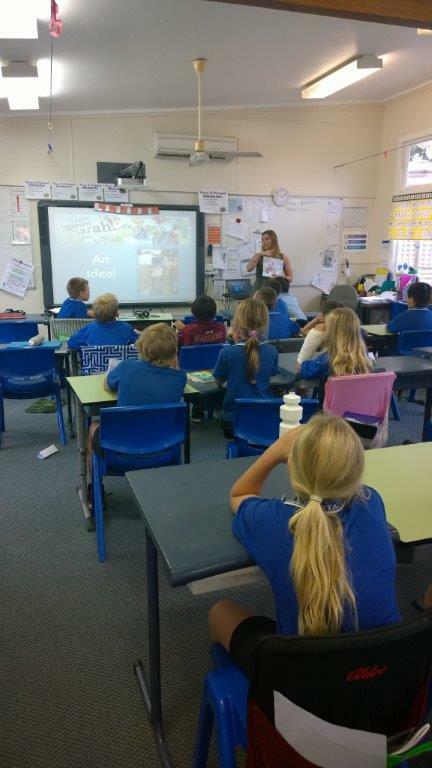 A great deal of thanks goes to Leah Trott for welcoming me into her classroom, her amazing grade 5 students, and to Gayndah State School. We were also able to run a fundraiser for book sales with proceeds going to the Gayndah State School P & C.
At the beginning of it all, Sarah was just a dream. In fact, as I sat there on the lounge before bedtimes, surrounded by my beautiful, little children as they eagerly drank in one picture book after the next, being able to read my own children’s picture book to my children was nothing more than a thought. And yet, that thought became a hope, and that hope became a possibility, and after hours upon hours of work and a huge amount of patience and belief, Sarah finally became a reality! Though my children were much older than I’d imaged they would be when Sarah arrived, we finally got to snuggle up on the lounge together and hold in our hands what had once just been in my mind. What was the most wonderful about this is that my children walked the journey with me… showing great excitement and interest at every stage of Sarah’s creation, seeing the reality that their own dreams really can come true, too. And when Sarah finally arrived, they were as excited as I was – maybe more! It was a beautiful experience for us all, really. To you, whether your dreams are of holding your own book in your hands, building a business, getting fit, competing as a professional sportsperson, raising a loving family, getting out of debt, or simply living a stress-free life full of joy and passion, I say that your dreams are all possible and every one can come true. Go after what is in your heart, be your unique self and bring something beautiful to your world! This entry was posted in Uncategorized on 09/05/2015 by One Heart. And finally the day arrived! What can I say?!?! It was a very happy day! When the advance copies turned up, I have to admit I was almost scared to open them! 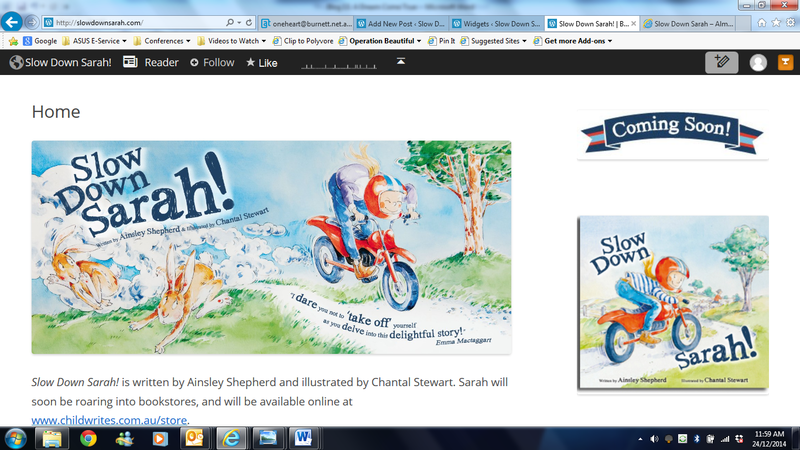 But when I did, it was such a pleasure to see Sarah on the front cover!!! And even though I knew the story inside out, I couldn’t help but take up her invitation to dive once again into the adventure! It was also a huge thrill to share the book with my children – I’d been able to keep the dedication page a secret from them, so when they first saw their own names in print, they were astonished… and absolutely thrilled! It was very special to share it with them. My parents had also had no idea I’d been planning to acknowledge them. It is true that they have always been my greatest supporters and always told me that I could do anything I set my mind to – and I believed them! What we speak over our children is very important! In addition, the reason I said that without them this story would never have been written, was also to do with the fact that they bought me my little red 50cc motorbike as a kid – the same motorbike which gave me my love of riding at “hair-raising” speeds (according to our neighbour), and from which the entire Slow Down Sarah! story was inspired! Soon after, the rest of the books arrived at the Child Writes office and I could start sharing them with others! It was thrilling – and scary – to share what had previously only been an idea within my heart, with those around me. 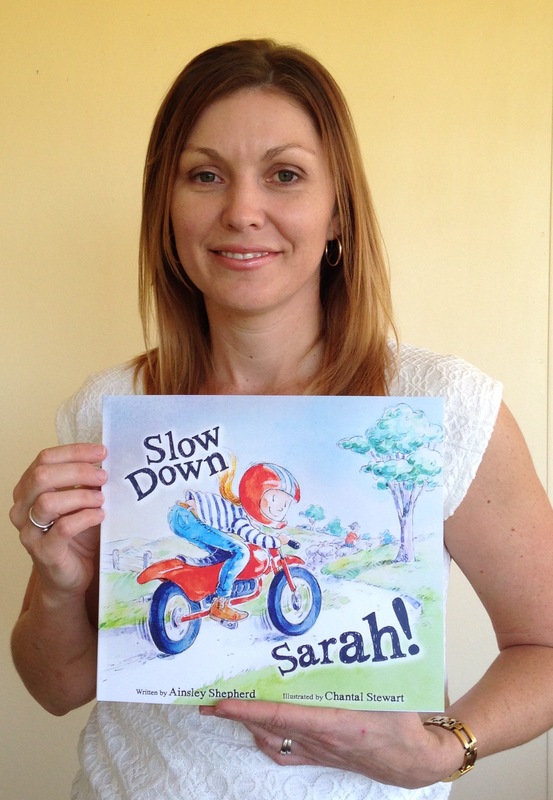 However, Slow Down Sarah! started receiving great feedback from the very beginning! I knew this was the start of another journey but I was feeling very excited about taking the trip! And then it happened. The next proof arrived (we were up to number 4 by this time), and it was right. F-i-n-a-l-l-y, right! I could not e-mail Lionel with quickly enough, with the go-ahead to print! What a relief! Of course, just as quickly as the relief came, it went again, as I realised that it really was only the start of so much more. Having my title accepted with the book distributors, finishing off this website to promote the book, getting marketing images created (once again thanks to Michelle’s brilliance), organising delivery of the books, and marketing through Child Writes and other channels – even getting ready to submit to competitions. I had known this work would need to be done, and had started working on the website and made bits and pieces of progress in other areas, but I knew it was now time to focus, get my marketing plan established, and prepare to sell out of my print run as soon as possible after it arrived! It was a lot of work and just part of self-publishing, however I still felt I was on a better rate of pay than what I would be getting had I been restricted to the 5% royalty a commercial publisher would offer me. Also, while it had been frustrating to get it just right, I’d maintained control over how the book would look – who knows whether I would have been disappointed with another illustrator or another graphic style? 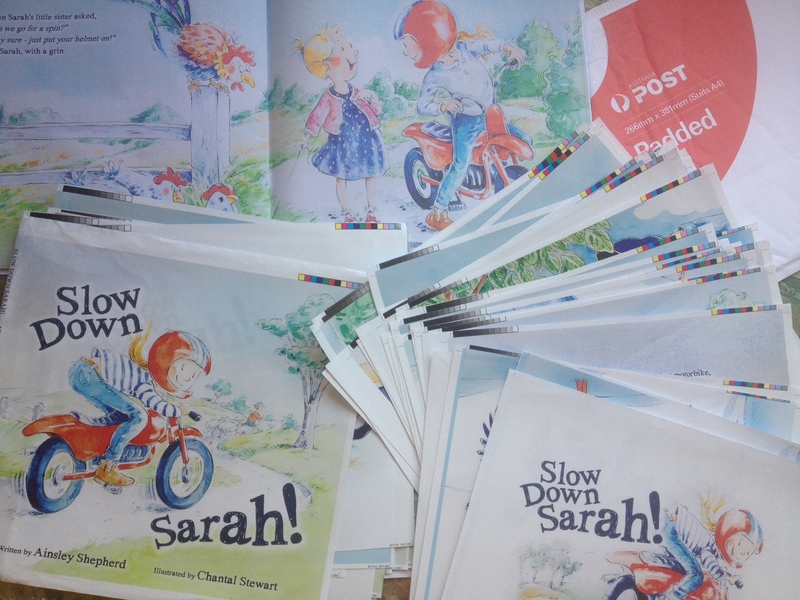 Slow Down Sarah! looked how I’d imagined it and that made everything else worthwhile. This entry was posted in Uncategorized on 24/12/2014 by One Heart. Alas, it was not to be that simple. When the proof arrived, I tore the packaging open with huge enthusiasm. I just could not wait to see it with my own eyes. It was not a perfect moment. While I was so thrilled to see the page layouts together in something that resembled a book, the detailed person in me could see definite problems with the proof. The images looked a little dark (particularly the backgrounds), the title page and dedication page images looked to be grainy or unclear, and one of the double page spreads in the book was blurry or a little hazy. Everything else was excellent! And in fact, I might have gotten away with it, if I’d just pressed forward. But neither Emma or I wanted to produce a ‘good enough’ book. We wanted, through Boogie Books, to produce an amazing book, which fully lived up to its potential. Of course, when you have no idea what you’re doing, everything is a learning curve. And it wasn’t just a learning curve for Emma and I – everyone involved in the process had to go back to the drawing board and figure out why these issues were issues. This whole process took many reviews and all in all another three (and a half) proofs were produced. Each time we tried to ascertain what was the problem – we re-shot images, re-worked the graphic file and co-ordinated with the printers. Still not all of the problems were resolved. I can write about it now in a few minutes, but this was not a short-lived process. In fact, the whole ‘review, adjust and try again’ experience dragged out into what eventually came to feel like a never-ending saga that lasted about a year! We eventually realised that there was no other remedy for the title and dedication pages than to re-do them… however it had already taken us a couple of attempts and new proofs to come to that conclusion. Some of the delays were waiting for the team to complete other deadlines before they could progress the project. Other delays were in waiting for proofs to be posted to team members or new proofs to come from printers. Sometimes it was just the fact that I almost could not bring myself to look at it and give the next review. By this time, I was well and truly over it! And no doubt so were my team members. Lionel was extremely patient and tactful, politely prompting and trying to get the project over the line. There came a point when he said ‘This book has had the longest gestation period of any book that I have ever produced.’ I knew exactly how he felt! I’d felt ‘pregnant’ with the dream of getting this book published, and yet had been unable to birth it. The word ‘frustration’ doesn’t even come close to how I was feeling at this time. This entry was posted in Uncategorized on 05/11/2014 by One Heart. After I had enjoyed that perfect moment – when I looked at the illustrations and revelled in the excitement and relief that they were perfect – came the reality: I had to keep working on this project if it was ever going to become more than a collection of beautiful pictures. So it was onto the next step… graphic design! 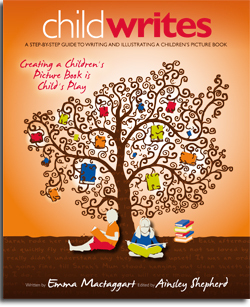 Working with Child Writes had introduced me to Michelle Von Pein – graphic designer extraordinaire! 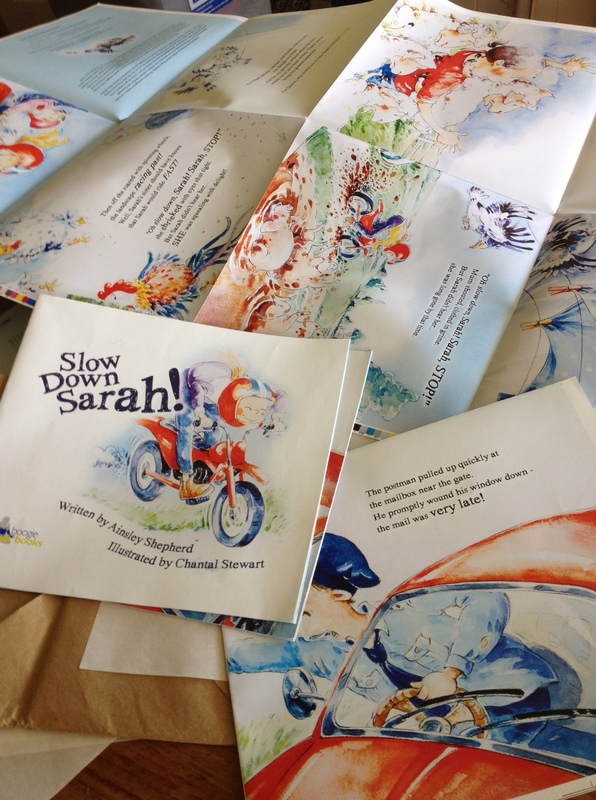 She agreed to work with me on Slow Down Sarah!, and we sat down together to get a feel for style, font and colours. We worked together until we were satisfied with the front cover, and then Michelle set to work waving her magic wand over the remainder of the book. Michelle had the wonderful idea of working the text very creatively – making it pop up and down, bolding, capitalising and using italics, to express the emotions and symbolism in the words. I liked the idea and how it worked. We also thought it would add to the enjoyment of both children and adults when the book was being shared. There was also the matter of having the illustrations photographed so they could be used in digital form. We’d tried scanning the images on commercial drum scanners, but the image quality was horrible. So we figured having the images photographed was the next logical step. Enter the beautiful and oh-so-talented Nicole Barralet from Nicole Barralet Photography, the creator of many of my and my friends gorgeous personal photography portraits. While Nicole was no stranger to product shots, doing a children’s picture book was a new concept for her, but she stepped in and saved the day beautifully. By this time, I had also been in discussion with a printing agent. The choice wasn’t difficult, as we’d used this agent without difficulty in the creation of Emma’s and my book, Child Writes: Creating a Children’s Picture Book is Child’s Play. Lionel Marz, of Red Planet Print Management, was extremely helpful and professional, and their quote was competitive. So, when the images were done, Michelle completed the file, and off it went to the agent for printing of a proof. All in all, things were progressing nicely, and I waited in hopeful and expectant anticipation for a beautiful proof and the ability to check the book off my to do list.